With Apple’s recent announcement of a MacBook Pro refresh, many have been quick to say that the HD front-facing camera, updated CPU, and superior GPU are the core updates to the popular computer line. However, one of the most innovative features is Thunderbolt, a high-speed connectivity solution that Apple actively collaborated with Intel on. Will this innovation make USB 2.0, and it’s still being adopted successor 3.0, irrelevant? Codenamed “Light Peak” in its earlier days, Intel’s unique port was made with the help of Apple, allowing for blazing routing speeds for both data and video through one single port. To give you a bit of perspective on the matter, Thunderbolt is 20 times faster than USB 2.0, twice as fast as USB 3.0, and 12 times as fast as FireWire 800. It is capable of transferring data at 10Gbps, which would allow you to move a full-length HD film in well under a minute. Drawing from preexisting technologies, PCI Express and DisplayPort, Thunderbolt provides expanded bandwidth and backwards compatibility. Without having to change anything, Intel’s latest innovation can interact with USB, FireWire, Gigabit Ethernet, and Fibre Channel ports. 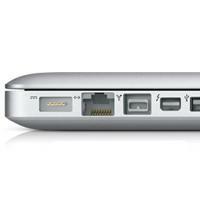 Thunderbolt has a wide-range of functions in addition to data transfer, including the ability to output 1080p video to external displays, even ones that do not have dedicated Thunderbolt ports. An adapter allows users to connect their computers via DisplayPort, DVI, HDMI, and VGA displays, also sporting the ability to output multichannel audio, up to eight channels at any given time. An added bonus to Thunderbolt ports is its contribution of 10 watts of power to peripherals, meaning that all of your pesky devices that are connected to walls and your computer will likely need only one cord in the future. Even better, many devices will be able to plug into one another without necessarily using a separate apparatus for charging. For a time, it seemed as if the computer industry was complacent with a USB 2.0 standard, though many were calling for the adoption of USB 3.0. It appears as if this would be almost irrelevant at this point considering the fact that Thunderbolt trumps the technology, delivering twice-as-fast data transfer speeds. One field in which it appears as if Thunderbolt’s presence will be felt is gaming, as the technology could likely replace USB as an industry standard if it becomes cost-effective. Another would be video production, where six different devices could be connected at once, providing instantaneous synchronization and collaboration. There is no doubt that Thunderbolt will bring efficient, faster wired communications to the table, allowing you to back up your hard drive in a matter of minutes and sync devices such as your iPhone even faster. As for wide-scale adoption, it is uncertain at this time whether or not this technology will succeed. As of now, the MacBook Pros are the only devices on the market with the port, but Intel has stated that a plethora of hardware manufacturers, such as Western Digital, are going to be bringing support later this year. What do you think? Would you be willing to switch out the cords in your home for the additional speed? Will we see wide-scale adoption of Thunderbolt? Sound off in the comments below.